Hey zinesters and comics artists! 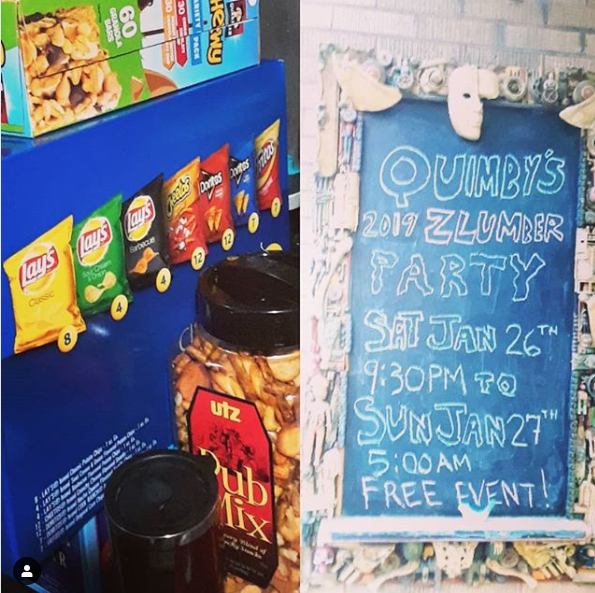 Come to our Zlumber Party (as in Zine Slumber Party)! This is the seventh year in a row we’re inviting you to come in and spend the night with us working on your zine, and start your year off with a creative frenzy! Get here at 9:30 on Sat, Jan 26th (the store closes at 10pm). Then spend the night here! Stay until 6am Sun, Jan 27th! (And yes, you can leave whenever you want before then if you want or need to.) So bring yer jammies and a sleeping bag, then leave in the morning with what you’ve been workin’ on! There will be snacks! And coffee! RSVP: Give us a holler so we have a head count and know how much pizza to order! : info(at)quimbys(dot)com. Invite your friends with the Facebook invite here. *In terms of what to bring, definitely whatever project you’re working on, whether it’s a zine, a comic, a book, a magazine, an artist book — independent publishing knows no bounds! *Be here at 9:30pm (the store closes at 10pm). This is NOT a lock in; you can leave whenever you want. You can stay as late as 5am on sunday morning, which is the official end time for the event. *Wear comfy clothes! Don’t forget your sleeping gear! A sleeping bag if you wanna take a break to catch a few zzzz (or just be comfy), a pillow, footie pajamas, a blanket, slippers…whatever makes you comfy. *We’ll provide some snacks and coffee, but you may want to bring some snacks with you if you like. A good way to make new friends is bring food, is all we’re saying. If you have food sensitivities or allergies please bring whatever nourishment you need to bring to sustain you. *We’ll also provide some office supplies (papers, pens, scissors, staplers, that type of thing), chairs and tables. Also, click here for more info about consigning at Quimby’s Bookstore NYC! Tags: overnight, Zine Slumber Party, zines, Zlumber Party.